Peter Robinson will not contest next May's Assembly elections and will step down as First Minister and DUP leader before that, probably after Christmas. He also hinted that the offices of First Minister and DUP leader will be split then. That happens already in Sinn Fein, where Martin McGuinness is First Minister but Gerry Adams is party leader. In the DUP's case it would probably be Arlene Foster as First Minister and Nigel Dodds as leader, but that has not been decided. Mr Robinson revealed his plans in an exclusive interview with the Belfast Telegraph ahead of this weekend's DUP conference. "I am telling you this now, because I think it would be disrespectful to the party membership if I was to go through a conference with the pretence that I would be leading the party into the next election. I think they have a right to know what the circumstances are," he said. He denied that health was a reason for leaving, saying he went to the officers before he had his heart attack on May 25. He added: "On the other hand, while I was lying horizontal in hospital I got all sorts of advice and lectures on what I should be eating and looking after myself, in terms of sleeping more than I allow myself at the present time. I was advised to avoid pressure and get more exercise. For at least a fortnight I kept all of those rigidly, but it is remarkable how soon you slip back into all those old bad habits with this kind of job." In recent months he has considered four or five hours "a good night's sleep". He added: "I am fortunate that I can operate with very little sleep but it does accumulate. You pay for it eventually." One reason for leaving now is that he has accomplished the aims he set himself as DUP leader and outlined in previous Belfast Telegraph interviews. These are a date and rate for the devolution of corporation tax, seeing his former East Belfast seat retaken by his protege Gavin Robinson and stabilising the Assembly. Democratic Unionist Party (DUP), REV. IAN PAISLEY SPEAKING AT A PRESS CONFERENCE AT STORMONT. INCLUDED (FROM LEFT) REV. IVAN FOSTER, PETER ROBINSON, JIN ALLISTER AND REV WILLIAM BEATTIE. 20/9/1984. Peter Robinson and Martin McGuinness are all smiles as they talk to Europe team captain Paul McGinley during the Morning Fourballs of the 2014 Ryder Cup at Gleneagles. 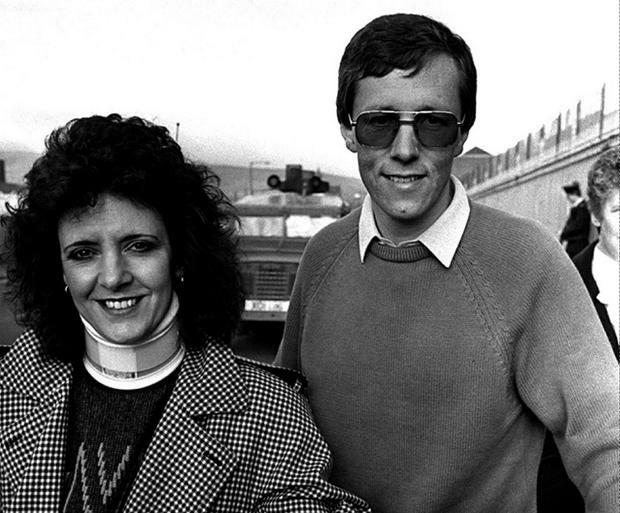 Canvassing together: Ian Paisley (centre), leader of the Democratic Unionists with deputy Peter Robinson (left) and his wife Iris Robinson as they embark on the election campaign in Carrickfergus, Co Antrim, Monday April 25, 2005. United stand: Peter Robinson and Gerry Adams at the funeral of Constable Ronan Kerr. Prime Minister David Cameron (centre) talks as Northern Ireland's Deputy First Minister Martin McGuinness (left) and Northern Ireland's First Minister Peter Robinson (right) listen during a press conference in the garden of 10 Downing Street in central London. "I believe that is now achieved," he said. "I have told the party officers that I don't intend to fight the next Assembly election for a wide range of reasons and not simply because those objectives have been achieved. I very much take the two-term view of politics at the top." He doesn't believe leaders should hang on too long. His predecessor Ian Paisley only retired in his mid-80s. Mr Robinson didn't mention that, but said: "For anyone who is not very young to go beyond two terms is stretching it. There are massive pressures on anybody in this job. You do need to renew political leadership, bringing in people with perhaps more energy and people with new ideas." He also revealed that he had twice previously proposed standing down to party officers. The first was in 2011, after the DUP won 38 Assembly seats, its highest number ever. "I felt that was an appropriate time to stand down. I was then persuaded by DUP colleagues that the transition process within the party wasn't at a state where that was a wise decision and I agreed to remain," he said. The second time was this May's Westminster elections. "We won back the East Belfast seat, we got more votes than in the previous election, a larger share of the vote than the previous election, more votes than all the other unionist parties put together and we were again established as the number one party in Northern Ireland," he said. "After that I again went to the party officers and I indicated that I did not wish to stand in the next Assembly election. The Assembly was in a very delicate position at that stage and I was persuaded that I should remain to try and steady that ship to get some level of stability within the political process." Now he has gone back a third time and this time they have asked him to stay a little longer to oversee the early stages of bedding in the peace deal outlined in the Fresh Start document agreed by the DUP, Sinn Fein and the British and Irish governments. "There are a number of fairly immediate decisions that have to be taken and they will then organise a transition," he said. "In the meantime I don't want people to be focusing on issues of succession yet. When the party officers declare the process - which I guess would be at the beginning of next year - then people can start looking at who the successors should be for leader and First Minister. Let's focus on the agreement and getting it bedded in." Mr Robinson and his officers authorised a comprehensive survey of their membership by Professor Jon Tonge of Liverpool. It was published last year under the title The Democratic Unionist Party: From Protest to Power. Mr Robinson has spoken of broadening the party and even recruiting Catholics, but the study showed the main denomination among members was Free Presbyterian and most activists were Orangemen. Mr Robinson believes the DUP is becoming more representative. He said: "The Free Presbyterians were, by that stage, a minority within the party, but they were the largest single denomination". He added: "There is a distinction between our party membership base and our support base, which is much broader than the membership. As the party gets bigger, I expect the party to catch up with the support base. That is what happens as younger people come in. That has to be handled well, because people oppose change almost genetically and in politics things have to change. Religion doesn't change, but politics has to change with conditions." The First Minister is looking forward to retirement and says his family are too. "I might be a journalist," he said laughing. "I have nothing decided and that is part of the attraction of it all. I am not the sort of person who sits at home with a blanket around my knees. I want to continue doing things." He intends staying in Northern Ireland, despite the risks. "I love the place and I have no intention of ever leaving it for good. I don't think I have had a holiday in recent years that I haven't had to come back from for an emergency situation. Now I can take a week or three away, nobody will care," he said. "There are many things that I could do and I have the opportunity to look and decide what is better for Peter Robinson for once, rather than have to look at wider concerns." Asked how his family feels about the decision, he said: "They would be less happy if they thought I would be staying at home kicking my heels, but everyone knows that is unlikely to happen. I had hoped and intended to stand down from politics somewhere between the ages of 60 and 65. I will be 67 in December so I think I have stretched that far enough." The DUP leader's wife Iris, who had a mental breakdown in 2010, is now much improved. "She is very well, thanks," he said. "She is engaged in a lot of activities and looking forward to my retirement and me spending more time at home." He recognises that living in Northern Ireland after he leaves office will create security risks, but believes they can be managed. "As soon as our paramilitary task force gets into the action I hope the issues around terrorism and paramilitary activity will continue to reduce," he said. He went on: "Terrorism is a worldwide plague, so, yeah, I will continue to be vigilant and there will doubtless be measures taken to protect me, but I am not going to live my life cowering under the threat of what someone might do. I will live as normal a life as possible." He believes terrorism is being absorbed into crime in some areas. "The general terrorist threat has already declined considerably and there is a real desire from people in Northern Ireland that we get rid of this shadow of terrorism. A lot is now concentrated on criminality and people making money for themselves." He was encouraged that the recent review of paramilitary activity found "that the whole purpose and direction of the republican movement was towards ensuring that peace and political progress were maintained and the process moved forward". But he warned: "If that were to change then the sanctions are there, as has always been the case, and you could not operate the Assembly on that basis. But we should be encouraged that is still the view of MI5 and the PSNI that republicans have peaceful intent." Responding to the announcement DUP MP Sammy Wilson said: "I have known Peter for more than forty years. For a large part of that time we were both elected representatives in the same area. We just weren't colleagues. We were friends. Throughout those years he has shown a complete focus on and dedication to the people he represents. His long career in East Belfast was one of hard work and securing the best outcomes for the area. "More latterly, as a government minister, I worked alongside him in the Northern Ireland Executive. His capacity for getting to grips with difficult and detailed issues was immense and unrivaled. During nearly eight years as the First Minister he has dealt with a wide range of difficult matters that might have bested other politicians. "Peter always thinks long-term and he can be proud that he presided over the longest period of unbroken devolution since the start of the Troubles and as he leaves front-line politics he can also take pride in knowing that he has built the basis upon which devolution can continue in Northern Ireland. "Peter has been with us from the early days. He traveled the length and breadth of country building the structures of the party. As he retires he can do so with pride. He led the party to its most successful ever Assembly election. Whilst he is stepping back from the leader's job, I know his advice and wisdom will always be welcomed."